This time of year you might notice a lot of updates happening online. A lot of social media sites make changes to their platforms and introduce new features around this time of year. With the new General Data Protection Regulation, or as you might have seen it called GDPR, updates are being made on blogs and other websites too. I decided I'd take advantage of this wave of updating to do some updating of my own. I'm doing a blog audit. I've already started making a few changes but thought that others might want to join in too and so I'm making it into a weekly challenge. This way we can all improve our blogs together. So why do a blog audit? There are of course, lots of other reasons for doing a blog audit but you get the idea. The general purpose is to improve your blog. Take a good blog and turn it into an awesome blog. 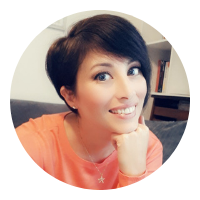 Over this summer I'll be doing my own blog audit, and I'd love for you to join me. Maybe we can give each other some new ideas for ways we can improve our blogs? So what kind of things will I be looking at? 1. I'll be updating my information pages. These are things like my About Page and my Legal Disclaimers. 2. I'll be updating graphics on my blog posts. 3. I'll be checking links in posts, and adding new internal links in posts. 4. I'll be updating my sidebar. 5. I'll be updating my media kit and press page. 6. I'll be looking into the ways you can follow my blog content and re-evaluating my newsletter. 7. I'll be researching keywords and making sure my posts are correctly formatted for good SEO. I'll be doing a lot of things to update and improve this website, but thought I'd share one element each week that I'm working on so you can do the same on your own blog. I hope you'll join me. This weeks task is to read your blog. Visit it like you would any other blog you read. Remember you're a visitor. Check in via desktop, and mobile devices if you can so you can fully assess your blog. Make some notes about what you like, and don't like about it. What could you improve? This should give you a good starting point for your blog audit to-do list. I always do a small blog audit at least once or twice a year but this year I wanted to do a bigger project and thought others might like to follow along and get some ideas for their own blogs. I'll be posting Blog Audit Challenge updates every Saturday and looking at a different topic/area each week. Awesome post! I need to do a lot of the things on your list, thanks for the reminder! Thanks. 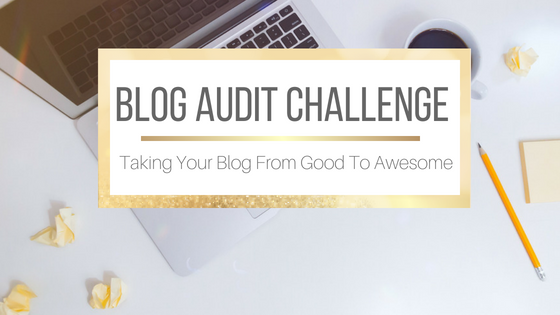 Check back every Saturday for the latest Blog Audit Challenge post. I'll be looking at a different topic/area each week. Thanks. So many little things can get forgotten throughout the year so I like to do a blog audit at least once or twice a year to update the site. I do the links check quite regular. good idea to do all of the above yearly. Checking links will be one of the most time consuming parts of this audit. This is a good idea! I need to take a look at things as soon as I get home from my road trip. I'll finally have some time! I'll be tackling a different area each Saturday with a task for each week. Have a great time on your road trip. Brilliant idea! Thank you for the suggestion. My pleasure :) I'm doing it myself anyway and just thought others might want to join in. What an awesome idea and challenge. Thanks for sharing! Thanks Heidi. Hope you'll join in the challenge. I've never heard about this! I'll be checking your upcoming posts! Great! I'll be posting a new challenge every Saturday for this. Hope you'll join in. Great! Hope this will help you.